If you need help with any question, please click on the next to the item below. Many fields have required responses (indicated by *). We will communicate with you via email. Please make certain to provide the email address(es) below to which you want us to communicate all musical information. After you complete this registration (including payment), you will receive a receipt via email. If auditioning to be a cast member, your child must bring the receipt to the auditorium lobby on October 22 or October 23 at 3:30 PM. Students must be available for rehearsals or shows from Jan 26 - Feb 3 and Feb 7 - Feb 10. Please note cast members will be required to purchase dance shoes for the show. Cast, Crew and Pit Orchestra registration for the Seaholm Musical. The 2019 production is Hello Dolly. Performance dates are February 1, 2, 3, 8, 9, 10. Do you love to perform? Can you carry a tune? What about some dance skills? All students are welcome to be a part of our musical. Whether on the stage, part of the set/tech crew or pit orchestra, your talents are needed and encouraged. Auditions for the cast are the week of October 22nd. Please sign up for a time slot to audition on the bulletin board outside the Choir room in the garden level G Hall. All students auditioning to be a part of the cast must attend an individual singing/acting audition on either Oct 22 or Oct 23 plus everyone must attend dance auditions on October 24 from 3:30 to 6:30 PM. Call back auditions are on October 25. 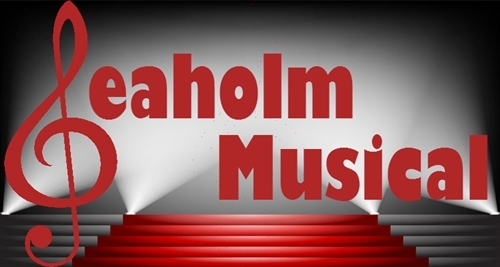 Further information can be found at www.seaholmmusical.com. For general questions, email seaholmmusicals@gmail.com. See Ms. Theis if you have questions regarding the music. See Mrs. Wolf regarding dates for pit orchestra auditions.